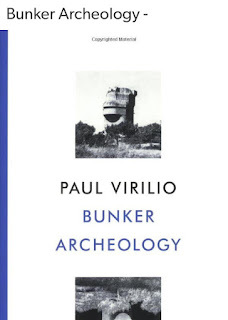 **This text was intended to be a quick Facebook post of a photo (referencing Paul Virilio's "Bunker Archeology" book) and a short quote to go with it - on how I feel about the curious construction of a WWII bunker in the middle of Albanian capital of Tirana. I thought I'd be a bit cryptic and vague about such very public acts, but apparently I had a lot to say, and since I don't know much about it yet, take these thoughts however you like, nonetheless, here they are. Without knowing much about the intent or scope behind the erection of the bunker in the middle of Tirana, I just wanted to point out how I feel about the insensitivity of such spatial gestures and executions - insensitivity not only towards the bunker, what it stands for and the baggage it comes buried under, but more so as a cleansing ideology thru the act of preservation - deterritorializing history and archeology alike. These gentrification acts have been quite the busy bees, making their way through the city with an almost surgical precision. Some you see, some you don't, lurking in shadows of that much elusive 'metaphorical' light, but only to replace it with its own reflection, turning depths into glares. Gentrification or urban cleansing is not something new. After living under a communist regime for half a century, we, of all people should be familiar with these acts of exclusion, or maybe they were so common, they became mundane and even expected - destiny, some called it, brainwashing is more like it (another act of cleansing) - that it escapes our ethics and sensibility towards anyone, ourselves included. Ideological cleansing as psychological warfare is not that different from a more physical kind of sterility, the urban one, the everyday life that shapes one's primal instincts and awareness. A cultivation that happens over a lifetime, every day, day in and day out, one that has a past, a fleeting present and a consequential future, timeless as in lasting legacy, not as in time-less, or without time, or at no particular time, or just an illusion - a perceived reflection, a constructed memory. A gloarified depth. It is through this history that we cultivate our sensibilities, the archeology of our human multitude, and the promise of future hope. It is this history that we exploit and sell to tourists. It is our country's painful, open wound that we celebrate with them. We need therapy, not glamor. We should champion ourselves as patients, not celebrities. That's beside the point, I know, but not far from it. This bunker and a few other very selective, very strategic, ‘projects’ (interventions) of recent times, are reenacting (very theatrically indeed) acts of cleansing on many levels and scales - as if their intent is to hit our primal and cultivated sensibilities all at once, without us realizing that our city has turned into a sideshow and our common life in it has become a puppet-act, where we're both the laughing audience and the puppets. The ones excluding and being excluded. Layers on layers on layers of cleansing, bleached out, trailed by a toxic trace, only to discover that it is missing a territory. We've been deterritorialized. Lingering ruins of what it once was and could become, but never fully realized. It is easier to see and understand at an urban scale and fabric, because it is so material and in plain sight. A gentrification on centuries of context (making the hyped nationalism quite ironic, I might add), these acts remind me of Prometheus stealing fire from the Gods and giving it to the masses, the mortals. Only, in this scenario, it is the public that gathers the wood sticks, constructs a pyramid-like stake and offers the lighting fluid and matches to our beloved demigods, our elected officials, watch them pour, light the match and throw it in, creating a spectacle, first of burning heat, then light and warmth, a big applause follows without anyone realizing that they already had the 'gift' of fire, the mechanical ability and all the necessary items to light that match. Why, then, didn't they? An intellectual trick of prestige? Or maybe a lifetime of psychological castration developed into insecurity, complexity, and incapacitated intellect. A sheltered intellect that is indeed present as the fire within, which burns our cognitive dissonance, warms our primal instincts and keeps a light on our cultivated sensibilities. These objects, as acts of gentrification are in a twisted way those acts of bringing fire to the masses (the instant burn, the resurrecting light, the fading warmth) and I'm afraid the demigods might really believe they're messengers, sent from higher powers (stealing from above might be a more appropriate act of duty) to do just that (tricked by own trick act), but without never arriving to realize that, yes, people have been playing with fire for a very long time, so long indeed that we wouldn't be here if it wasn't for it. That history. That context. Those burning stakes. Yes, we've had the bunkers. We've even dug up their essence and are still enduring its claustrophobia. What's the point of making it anew and put it on display?! Don't insult my intellectual sensibility or the public's apprehension of facts! Don't just show me later, tell me now! Let's play! With and around the fire! Throw an animal sacrifice in it. Would that bring us closer, or just bring out the parochial in us?